Hello All …. 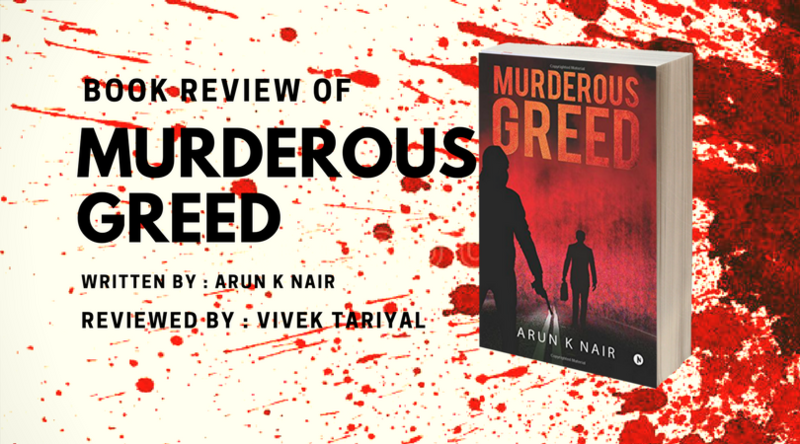 Before going deep into the review of Murderous Greed by Arun K Nair, I would like to congratulate the Author for his efforts. Every Literary work is unique in itself and the review given below is an honest result of my understanding on the subject and must not be taken otherwise. About the Book : The story revolves around murder of a businessman named Kartik and necklace snatching incident with a woman named Kanaga. Both the incidents took place minutes apart on 25th March 2017. Police inspector Satyajit is investigating the case and with only one witness to the murder named Drishti the case seem to be very complicated. The pointer of doubt moves from person to person while many mysteries get revealed to Satyajit to his astonishment. The police commissioner wants to shut the investigation down while Sriram one of the biggest competitor of Kartik reveals about the deal struck between him and Kartik. But betrayal and deception can change an entire plot altogether. About Writing : The author has put in great efforts in writing plots and describing people & situations. One can easily identify that everything is written with a detective view point which is the real requirement of this kind of writing. The text is simple and lucid and use of simple words to describe people and situation makes it an easy and interesting read. The reader can connect to the story very well and credit goes to the author’s writing flow and editor’s (if any) work. The timing of revealing the mystery at various points is just perfect which keeps the reader motivated (to read further) throughout the reading process. Every character has been given due exposure and there is no excessive narration of situation or plot. The ending of the novel connects every single thread and completes the story on a positive note. Author has been successful in creating enthusiasm for the upcoming sequel of the novel through epilogue. The author has discussed the murderous nature of greed that dwells inside every living individual. The level and type of greed differs from individual to individual and so is the extent to which one goes in life to fulfill the greedy desire. The author seem to try balancing the concept of being right while actually doing wrong and has tried hard to at least put this thought for reader’s conscience. Since being right or wrong is all situational, hence author or anyone else as a matter of fact can hardly generalize anything on such subject. As most of the story revolves around Karthik’s murder the cover image should have been more focused on the same. Despite all critical views, the words and story seem to come out from depth of Author’s heart and his effort is appreciable. I once again congratulate him and wish him luck for his future endeavors. Vivek Tariyal is an Engineer by profession and a Poet and Writer by heart. A Gold Medalist in B.Tech (Applied Electronics and Instrumentation) from Uttarakhand Technical University he is working as an Engineer (Tech) in Energy Efficiency Services Limited (Ministry of Power, Govt of India). According to him Literature is the property of society and writings of the authors are the need of society and time. He has published a Hindi Poetry Collection titled "Uday - Ek Nae Yug Ka" and is soon coming up with his debut novel based on the theme of women empowerment.